Call A to Z Entertainment, Inc. today for free information about how to hire or book Christian musicians the Desperation Band. We are your best agent and talent agency for booking and hiring contemporary Christian music singers the Desperation Band! We book or help you hire any live Christian Music bands you want, in addition to those you see on our site. We also help you plan and produce you show or event, so call us today at 888-655-4575 and we’ll be glad to help you. Led by Jon Egan, the Desperation Band was birthed out of the student ministries of New Life Church in Colorado Springs. They are recording artist with a great family of worshippers from Integrity Music. Pastored by Brady Boyd, New Life Church and the Desperation Conferences are the core of who they are. Released in the Fall of 2011 came an independent release from Dband called UPDATE: LIVE. This album, raw and barely edited, is a worship experience taken from the Desperation Conferences. On the back of 16 of Dband’s favorite songs from the past few years, this is the sound of the desperation movement, 10 years strong. On April 10th, 2012, Dband released the critically acclaimed Center Of It All, a studio worship album produced by Paul Mabury (Hillsong, All Sons and Daughters). This was the band’s first experience with an outside producer. 12 brand new songs, most of which were collaborations with writers Jason Ingram, Paul Mabury, Mia Fieldes, Kari Jobe and others. Center Of It All highlights the growth of this New Life Church based worship team. “As we’ve matured and simply gotten older, we’ve found that we come alive most while leading the church at large. All ages. Multi-generational. Though we love to lead young people and always will, we have found that the songs that have most impacted our youth are the songs that have most impacted the church. Center Of It All is a collection of songs for the broader church, not aimed at one age or generation. God is blurring the lines between young and old. We are one. The blessed church is the unified church.” – Jon Egan Songs from Center Of It All include Strong God, All To Him, and Take Me To The River. Desperation Band was originally formed in 2001, when New Life youth pastor David Perkins launched a youth movement for local churches called Desperation. They hold multiple Desperation Conferences every summer in Colorado Springs. The Conferences draw thousands of high school and college students who are desperate for the greater things of God. The emphasis of the conference is wrapped up in “The Vow,” a commitment to PASSION, INTERCESSION, CONSECRATION, and MISSION. Over 30,000 young people have signed the vow and the stories continue to pour in about the difference they are making in their world. Made up of several committed musicians, the band often travels to conferences, churches, festivals, and concerts throughout the world. They are best known for writing songs like “I Am Free”, “My Savior Lives”, “Amazed”, “Here In Your Presence”, “You Hold It All’, “Yahweh”, and “Overcome.” Several of these songs have been covered by mainstream Christian bands and many songs are sung in churches throughout America and around the world. Desperation Band has recently partnered with David Todd from 709 Agency. David’s management and direction has brought a new level to Dband as they have done their best to steward what God is doing. Always working as an in-house operation, drummer Jared Henderson carries the load of Dband’s web presence through video blogs, episodes, and social media. Jon Egan creates and implements the graphic design/brand for the team. Production head Cory Reynolds has directed and edited much of the video content around the band. 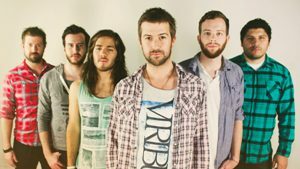 Jon and the Desperation Band co-founded “Heartwork”, a ministry to the youth of the world that empowers them to be hope and freedom to the orphans of the world. Starting June of 2010, Heartwork launched “the 1k Campaign”…1,000 orphan projects built by 1,000 student groups in 1,000 days. The clock is ticking. The needs are waiting to be met. Having helped hundreds of clients, we’re your best talent agency and agent for hiring and booking contemporary Christian music group the Desperation Band. We can help you book or hire any Gospel and Contemporary Christian Music singers. So call 888-655-4575 today and we’ll be happy to help you. A to Z Entertainment, Inc. is not the exclusive agency for any live entertainers on this site, but we’re the best.